The Ha data was quite faint and showed no different features, so I used only the OIII data, colorize to teal blue, for this image. Note two very small patches of nebulosity just to the lower right of the main nebula. Exposure: Total exposure time about 12 hours; 33 x 20 mins OIII, plus 15 x 1 min each RGB. All bin 1x1. Guiding Hardware: ASI120MM, Celestron off axis guider. Guiding scale 0.46 arcsec/pixel. 1 second guide exposures. Processing: Bias, darks, and flats. Stacked and processed with PixInsight, with a few minor modifications in Photoshop. The nebula is OIII, colorized to teal blue, and layered onto an RGB star field in Photoshop. 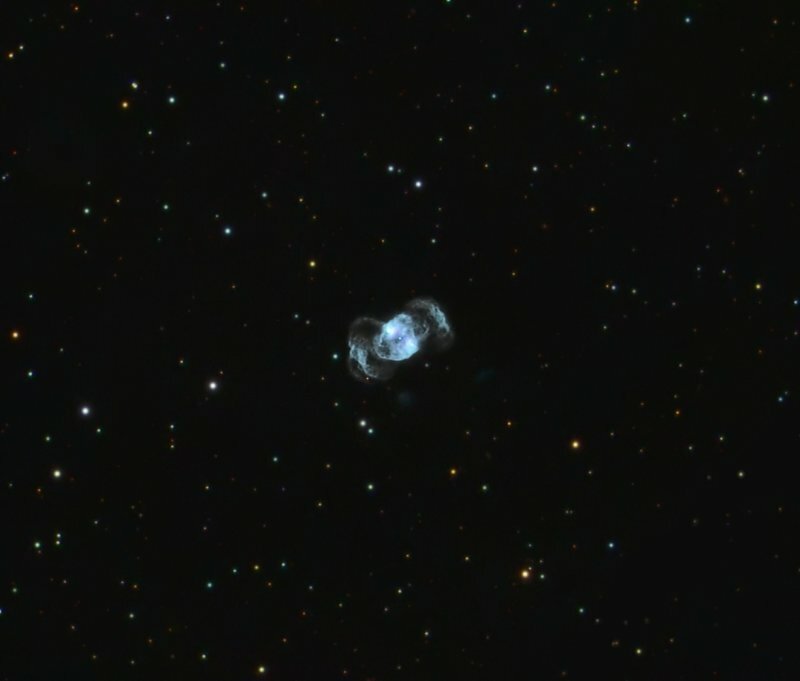 Those weird OIII blobs are present in some other planetary nebulae.